BRISTOL, TN - Since Bristol opened in 1961, every NASCAR Winston Cup Champion, with only one exception, also recorded at least one victory at Bristol, and since 1965 won at Bristol before going on to win the title. In 21 of the 34 years, the champions won in their title years, beginning in 1965, when Ned Jarrett won the crown. 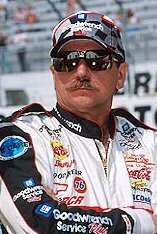 Today his son Dale Jarrett  a Bristol winner in the 1997 Goodys Headache Powder 500  could further prove a Bristol victorys worth. Since Bristol opened in 1961, only Bobby Isaac in 1970 won a title without recording a Bristol victory. before winning his first of seven championships, considered the facts and offered an explanation. "Bristol is an intimidating race track to start with," said Earnhardt. "Its an aggressive race track. It lends itself to the style of a Cale Yarborough, a Darrell Waltrip, a Dale Earnhardt, a Rusty Wallace. Its aggressive racing. I dont know if winning a race there makes a difference when it comes to winning a championship, but if you can handle that kind of adversity and challenge of that track, then surely you can go on and win other races and win championships. "You have to go into that race with the mental attitude that youre going to beat that race track," Earnhardt continued. "People often say, Aw, its going to be a hot day, or Its going to be a really long day. Im excited when I go to Bristol. I cant wait, because I know its going to beat drivers down and Im going to overcome them and Ill have a better shot at winning because of it. "If you can win at tough tracks like Bristol and Darlington, you can win at a lot of places. Win at Bristol, and youve pretty much got the other places in the bag." Bristol Motor Speedway, a .533-mile high-banked oval, is a division of Speedway Motorsports. Inc., a New York Stock Exchange company. Speedway Motorsports, the owner and operator of Atlanta, Bristol, Lowes (Concord, N.C.), Las Vegas and Texas Motor Speedways, Sears Point Raceway and 600 Racing, is a leading marketer and promoter of motorsports entertainment in the U.S.